With all the individual models created it is time to put them to use. 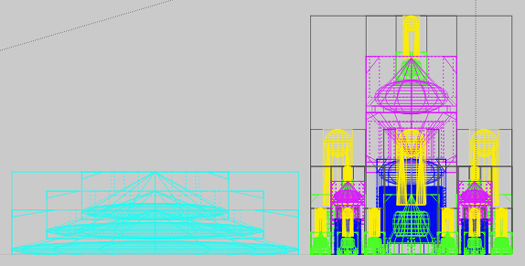 So the next stage will be assembling all the pieces together to create the final model for use in your scene. The city consists of five main components, which will be duplicated and arranged accordingly. 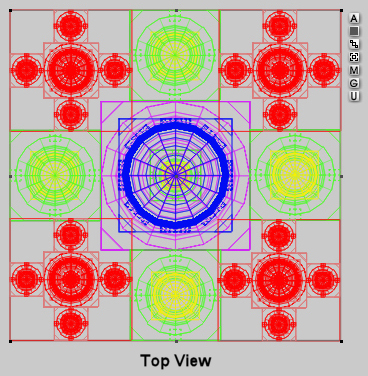 This stage of the process will involve alignment and grouping for ease of use. They will also be color coded using the family feature. 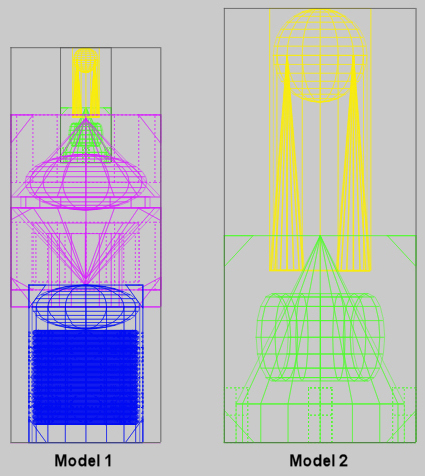 First, load a Center Dome and change the family color to purple then a Dome model and change the family color to blue. 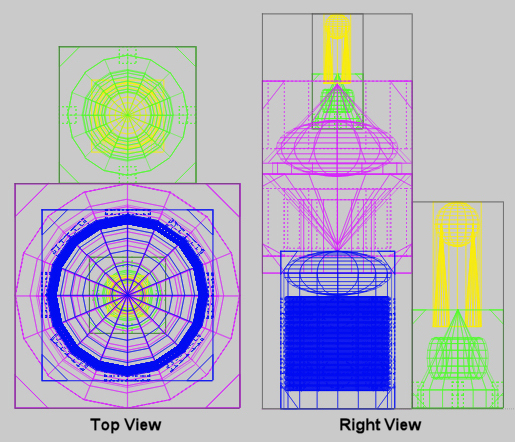 Next, place the Center Dome above the Dome and align it as shown below (place the point of the lower cone on the top of the sphere) and group the two together (Ctrl-G). These will become the centerpiece to creating the city. Name the group something like "Dome Group 1". 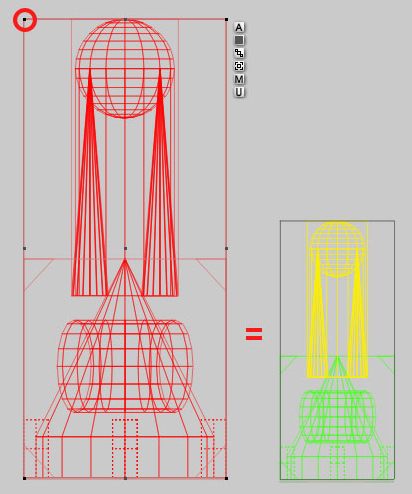 Now, load a Tower model and change the family color to yellow then load Structure model and change the family color to green. 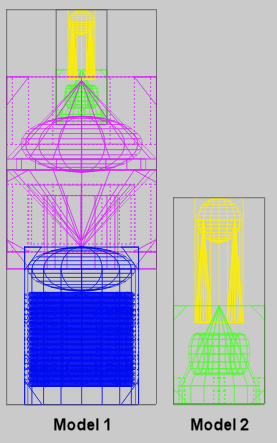 Next, take the tower model and align it with the structure model as shown below (reduce the size of the tower if needed to get a similar scale to the structure) and group the two together (Ctrl-G). Name the group something like "Main Tower 1" or "Tower Group 1". 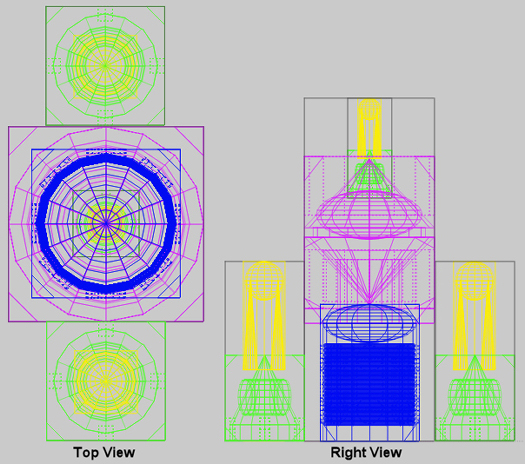 With the scale reduced on the duplicate, place it above the Dome Group, and place the bottom of the tower just inside the sphere of the dome then group them all together (Ctrl-G). Name the group something like "Main Dome 1". 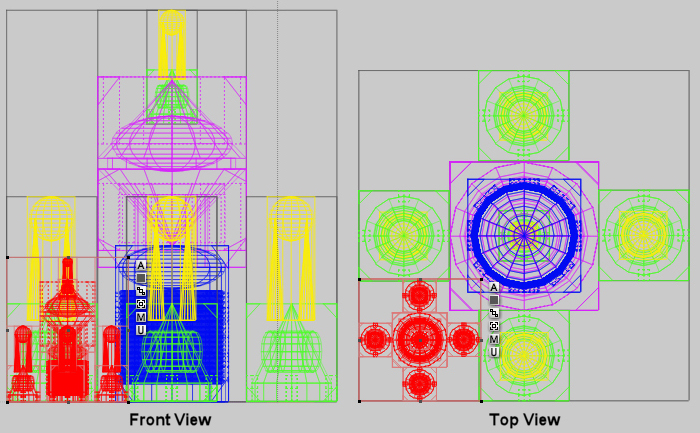 You should now have two models made up of all the parts created originally. The next stage will be to duplicate model 2 and arrange them around model 1. 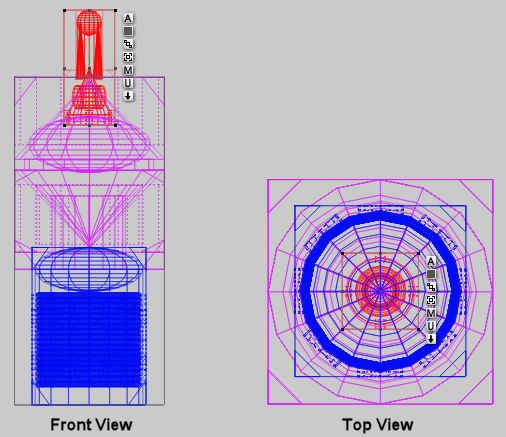 Align model 2 with model 1 so that model 2 is at the 12 o�clock position. Select both versions of model 2 and duplicate them (Ctrl-D) so you now have four in total. Group the two duplicates together (Ctrl-G) and enter the attributes menu by clicking the button by the bounding box. Enter 90 in the Y-rotate field and click on the checkmark to accept the changes. Ungroup the two duplicates (Ctrl-U). 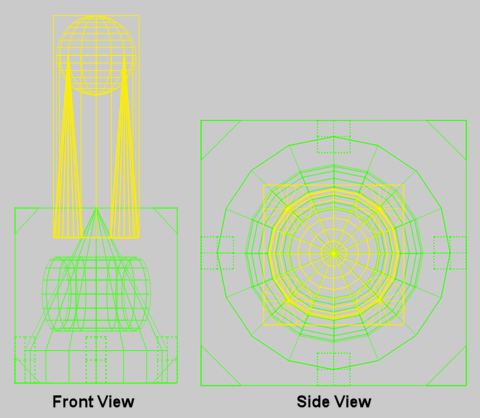 You should now have model 2 and the duplicates you made arranged around model 1. Select all the models and group together as one. Name it something like "Building Group 1". 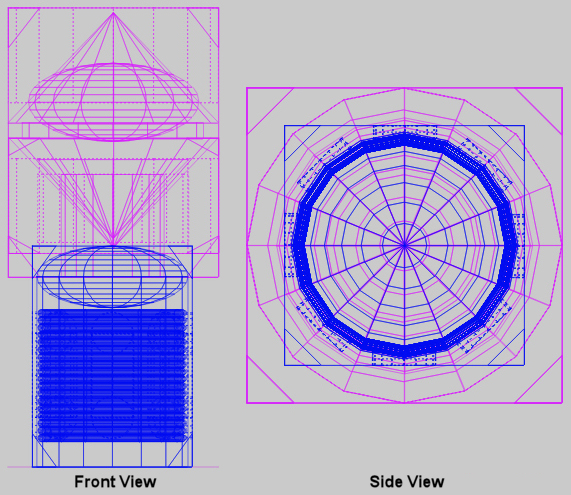 With the group selected duplicate it (Ctrl-D) and reduce the scale to around a quarter of the size and align it in one corner of the larger group as shown below. 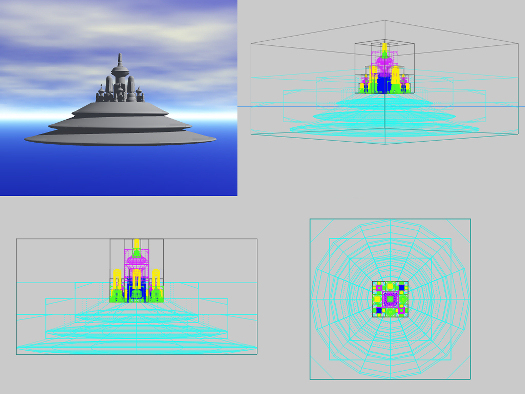 Notice how the edges of the small group slightly overlap the edges of the larger towers. 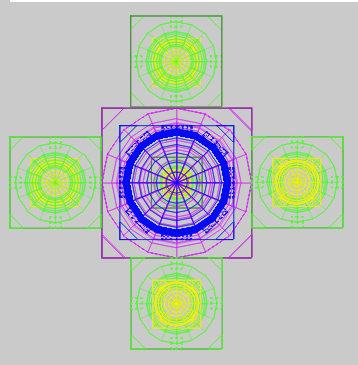 Duplicate the small building group (Ctrl-D) and change both X and X-origins to positive. Select both small building groups, duplicate them (Ctrl-D), then group them. Access the Object Attributes by clicking on the button next to the bounding box, enter 90 in the Y-rotate field, and click on the checkmark to accept the changes. Ungroup the duplicates by clicking on the button once, then select all objects and group them together. This will complete the buildings for the city. Name the group "City 1". Load the city base from your Objects Library and change the family color to light blue. Move the city above the base and align it with the base as shown below, lining up the bottom of the city with the top of the second cutoff box, then group them together (Ctrl G). Enter the attributes menu and give it a name such as �Cloud City 1�. Save the city as a Bryce file with the same name, ready for later use.